As I wrapped up the demo I turned around and noticed his eyes and mouth were wide open with astonishment. Picking his jaw off the table he told me the same grid I’d just made in minutes would’ve taken him several days. In all honesty the lightning didn’t strike that hard, but it definitely left an impact because as we were leaving he made a beeline for his office to try it for himself. Seeing Pointwise for the first time (click image for source). I enjoy visiting our customers. And I especially enjoy showing them some new technique or feature that we’ve either recently released or they haven’t encountered. 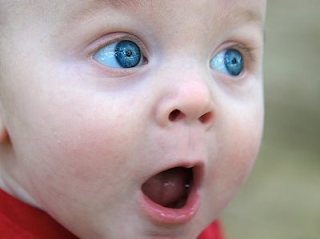 But nothing compares to some of the reactions I get when demoing Pointwise to a Gridgen user. This was one of those visits, and they are more common than you might think. The development of Gridgen started 30 years ago. At the time it was a project for the U.S. Air Force and NASA with the goal of developing an interactive meshing platform for computational fluid dynamics. I encourage you to check out this article in The Connector. It’s a great look back at how Gridgen the software and Pointwise the company came to be. After 20 years developing Gridgen, what sparked the development of Pointwise? The answer is a number of things, but the number one reason was the user interface. Gridgen was cutting edge technology when it was developed as an interactive meshing tool in the 80’s, but it was beginning to show its age in the late 90’s and early 2000’s. Deep, nested menus and the verb-noun paradigm made it challenging to efficiently generate grids for the ever more complex geometries being presented. And as Gridgen matured it became more difficult to be responsive to customer requests simply due to the way it was architected. A change was in order, and that change began in 2003 when the first lines of code were written for our current meshing product called Pointwise. Gridgen’s 1980’s style user interface with deep menus makes it inefficient at generating the complex grid assemblies encountered today. While Gridgen was based on 1980’s software technology, Pointwise was architected using more modern software ideas that allowed us to become more responsive to customer requests. It wasn’t a re-write, it was a re-engineered Gridgen, building on the nearly 20 years of experience we had accrued in the fields of mesh generation and CFD. A flat user interface and a shift to the more familiar noun-verb paradigm promoted a more efficient meshing experience. And an “undo” button. We knew from the beginning that Pointwise would have the ability to undo meshing operations. The Pointwise user interface in all its glory. Commonly used actions are only a click away. Pointwise V16 was released in the fall of 2007, four years after development began. We regularly push out updates to keep up with the requests of our growing customer base. Just recently we celebrated our latest major release with unstructured hex meshing capability. It’s an exciting time and the Pointwise code allows us to get features into our customer’s hands faster than ever. The Glyph2 scripting language of Pointwise provides access to every function available in Pointwise. Glyph1 was a Gridgen add-on and included access to most, but not all, functions. Pointwise runs on Windows, Mac OS, many flavors of Linux, and supports both 32-bit and 64-bit architecture. Gridgen runs on Windows, Mac OS, Linux, and several flavors of Unix, but if you wanted to generate large grids you were limited to 64-bit Linux only. 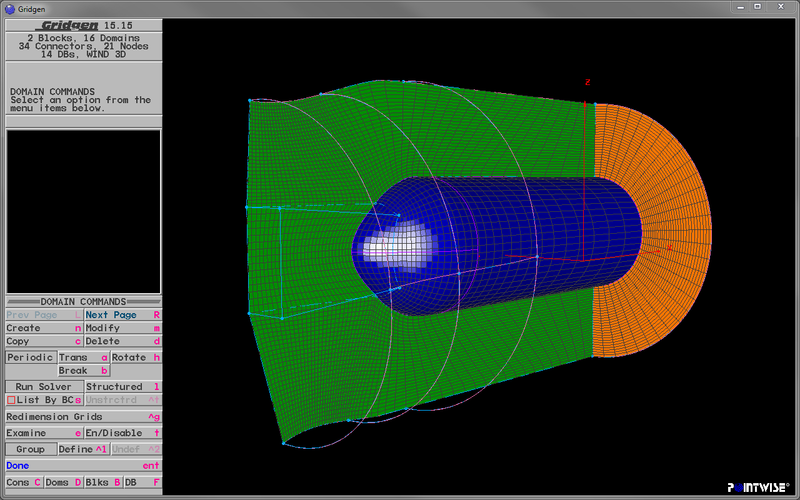 The Pointwise interface is flat and accessible. An entire grid can be generated solely from the toolbar. 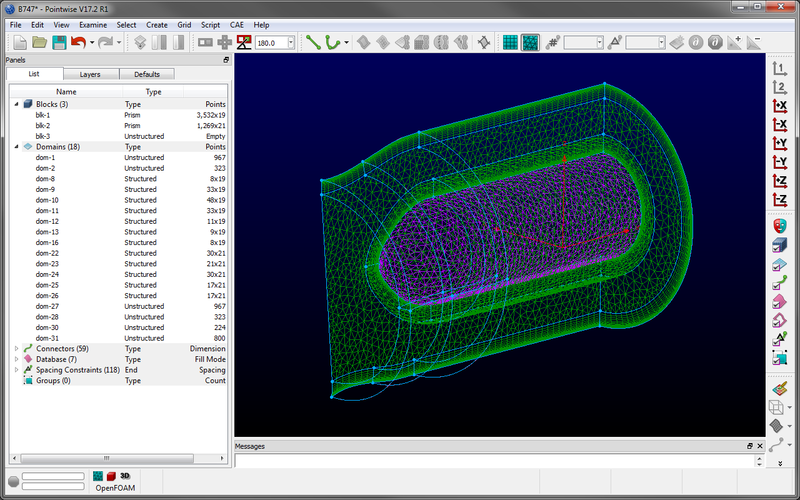 Gridgen’s interface has a bigger learning curve with its deep menus requiring patience and detailed knowledge of the meshing process. Pointwise is actively developed. We regularly release updates that contain new features and bug fixes. Gridgen is maintained, but we are no longer actively adding new features to it. Pointwise can generate unstructured hex elements using T-Rex. Gridgen can not. Pointwise’s plugin API provides complete access to the grid model and a number of plugins have been written by third parties, including the open source SU2 and OpenFOAM. Gridgen has no such plugin capability. Assemble structured domains and blocks automatically using Pointwise. You can’t do that with Gridgen. In Pointwise you select an object and apply an action, noun-verb. In Gridgen you had to pick an action then an object, verb-noun. When I want to italicize a word I don’t click on the italic button then go select the word, that’d be backwards. With noun-verb the entities stay selected so multiple operations can be performed on them in sequence without having to re-select them. Pointwise includes native CAD readers for Acis, Catia V4 and V5, Siemens NX, Parasolid, Pro/E, Solidworks. Gridgen does not have native CAD readers. Pointwise has multiple-level undo. Nuff said. In all seriousness, without Gridgen there would be no Pointwise. Gridgen was a necessary step in the right direction and provided the foundation on which Pointwise now stands 30 years later. We look forward to the next 30 years and we hope you do too. Still using Gridgen but interested in making the switch to Pointwise? If you have current maintenance you already have the right to use both Gridgen and Pointwise. Visit our download page and install the latest version of Pointwise. Prepare to have your mind blown. Mind blown (click image for source). This entry was posted in Off Topic and tagged Glyph, Gridgen, history, Pointwise. Bookmark the permalink.